Air pollution is becoming more and more serious and air purifiers are becoming a necessary appliance in many houses. However, there is a lot of types about air purifiers and there are too many brands on the market, which can inevitably confuse consumers who do not do lessons about air purifiers. How many factors will you take into consideration? What are the main air pollutants in your home? Haze pollution is relatively serious, or formaldehyde and other chemical pollution are serious? According to the type of pollutants to be purified, it is recommended to choose those air purifiers with relatively large CADR value. What’s the area of your room? According to the way that CADR value is multiplied by the coefficient (0.07-0.12) to estimate the applicable area of the product, you can choose appropriate product based on the estimated area. Are you concerned about the noise hazard? When you purchase a air purifier, it is recommended to consult the product’s testing report to ensure that the noise level is up to standard and to turn on the machine to listen to the noise it makes. Are you concerned about energy conservation? It is recommended to pay attention to the product’s purification efficiency and standby power. The higher value of the former indicates the more energy-efficient. It is the best when the value reaches to the efficiency level. For the latter, it is good as long as it is up to standard. What is the age range of the users? If the product is mainly for the elderly and children in the home, it is recommended to select a purifier with microbial removal function. How about the working environment? If the living environment is relatively wet, it is recommended to select products with antibacterial and antifungal function. Are you concerned about the service life of the filter screen? If you do not want to replace the filter screen too frequently, you can choose those purifiers with a large value of CCM, which had better not be less than P4 and F4. Do you mind the ways of replacing the filter screen? If you do not want to replace the filter screen regularly, you can choose the purifiers with the electrostatic principle. Cleaning the purification components of such purifiers can restore their functions. However, you also need to pay attention to the problems of harmful substances’ release such as ozone. Do the air purifier apply HEPA technology? HEPA (High Efficiency Particulate Air Filter), is mainly applied to collect particle dust and all kinds of suspended objects below 0.5 um. HEPA filters use superfine fiberglass as filter material, offset paper, aluminum film and other materials as partition plate and stick together with wood frame aluminum alloy. It uses special odorless silicone rubber. Being used for a long time, its surface cannot harden or appear cracks with a good chemical stability and corrosion resistance. It can absorb the stress produced by expansion and contraction without cracking. It has medium hardness and good elasticity. Each filter will be tested by sodium flame method. These filters have such advantages as high filtering efficiency, low resistance and large dust-holding capacity. Many air purifiers with low prices do not have this technology. How about the post-sale cost of the product? Some purifiers’ prices are relatively expensive, but there is no need to replace the filter screen. Some purifiers are not expensive, but later you need to spend much money on the replacement of filter screens, which you need to take into consideration beforehand to check if the cost exceeds the budget. The comprehensive evaluation score below is calculated by such indexes that affect the quality of air purifiers as CRAD, CCM, noise, purification efficiency and so on. The higher the comprehensive evaluation score, the better the overall quality of the brand. CADR: CADR means clean air delivery rate, refers to the rate of cleaning air (in m3/h) that the air purifier can provide. It is an important index to measure the ability of purification. The air purifier may have different CADR value when it deals with different target pollutants including particles (such as PM2.5) and gaseous pollutants (such as formaldehyde). The bigger the CADR value, the stronger the ability of purification. CCM: According to the international definition, CCM, cumulate clean mass, refers to the total quality of cleaning the target pollutants when the CADR of the air purifier reduces to 50%. It is an important index to measure the ability of cumulate purification. The particle CCM is divided into four levels P1-P4 and the formaldehyde CCM F1-F4. The higher the level, the bigger the CCM value, which means a longer period of replacing or cleaning the filter screen. Noise: Noise is the sound that the air purifier makes when it is in operation. The higher the CADR value, the bigger the air volume and the higher the noise (in dB). Purification efficiency: Purification efficiency refers to the CADR that the air purifier can provide in each unit of power. It is measured in m3/W.h. The bigger the value, the more efficient the air purifier and the better effect of purification. Nowadays, Blueair is the global leading brand in indoor air purification systems. Its air-purifying products are used by Ritz-Carlton Hotel, Apple Inc. and so on. In the Consumer Reports evaluation on air purifiers, the Blue Pure 211 of Blueair scored 89 points, far ahead of other brands and types. Even in low-speed mode, it can still have an excellent purifying effect. The Blue Pure 211 is recommended as the “most-worth-buying” type. In addition, Blueair 503 and Blueair 650E are also rated as the “best air purifier” many times by foreign media. If you have a limited budget, the Blueair 403 is also a very good choice for you. Its performance is equally remarkable with each index above average. Its price is around $500 and the applicable area is between 28 and 48 m², which seems very reliable. Honeywell, with a history of more than 130 years, is the top 500 diversified high-tech enterprise. Its business involves many fields such as aviation products and services, buildings, home and industrial control tech, automotive products, turbocharger, special materials and so on. As a designated supplier of NASA’s environmental control system, Honeywell has outstanding technical expertise in air purification. It has invented the two-stage electrostatic precipitation filtration technology early in 1956 and now it is the world’s leading brand in managing indoor air quality. Honeywell’s KJ450F-PAC2022S has a good particle purification ability with CADR value up to 477 m3/h. However, it can just perform normally in formaldehyde CADR and solid pollutants CCM. The low CCM value of solid pollutants means a frequent replacement of filter screens, which increases it use-cost. The customized version of KJ-450F-JAC2022S is only sold at around $450 with applicable area up to 31-54㎡. Its cost performance is pretty good. In addition, it is also equipped with smart APP control system which allows the users to operate the machine remotely on the way home from work. You can enjoy fresh and healthy air when you get home. It can also detect the indoor air quality in real time. You can switch the high-speed mode and sleep mode at your will, which is really convenient. If you have a new house and you have a greater demand for the purification of formaldehyde, you can choose KJ550F-PAC2156W. The gaseous pollutants purification CADR value of this type is 250 m3/h and it is sold at around $700 with applicable area up to 38-66㎡. IQAir, a well-known Swiss brand, has always been the international research and development professional of indoor air purification. During SARS period in 2003, it became the designated supplier of air purification system for Hong Kong Hospital Authority and it was selected as the “Best Product” of household air purifier many times by Consumers Digest Magazine. In 1998, HealthPro 250 series of air purifiers were officially launched and performed excellently in the tests from Stiftung Warentest, a European product testing organization. This series have been selling well all over the world. The newest generation products adopt the process design of 3 layers filtration. In the first layer, the PreMax filter element can filter effectively the bigger particles in air such as pollen and pet hair. In the second layer, the V5-Cell filter element can absorb formaldehyde and other harmful chemicals through granular activated carton. In the third layer, the filter element applies the special HyperHEPA filtration technology which allows it to have a smaller filtration diameter and an extension area of 5 square meters, so it can collect effectively the tinier particles and have an outstanding filtration ability. However, its shortcoming is low energy efficiency and big cost for replacing filter element, which results in a higher use-cost than other brands and types. HealthPro Plus 250 applicable area of 75 ㎡ which is suitable for those consumers with abundant budget and big housing area. SHARP is the leading brand of air purifiers in Japan with a market share of over 30%. 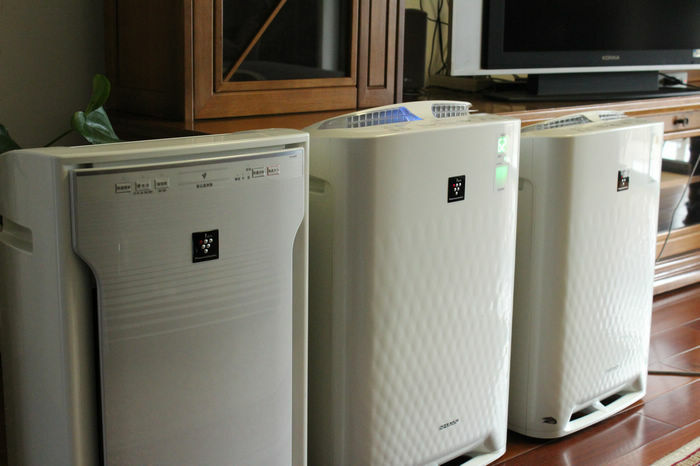 Its air purifiers’ functions such as humidification and sterilization are favored by Japanese consumers. In the American Consumer Reports evaluation on the air purifiers, SHARP’s FP-A80U is also selected as the most-worth-buying air purifier type because of its excellent performance in purifying ability and energy efficiency at high-speed mode. SHARP air purifiers adopts active purification technology to purify the air by releasing the unique plasmacluster to control the virus and mold that floats in the air. And they are also equipped with humidification system to enable the purifiers to sense intelligently the ambient humidity and increase moisture properly. SHARP’s KI-GF70-N has an excellent performance in purifying particles with CADR value of purifying three different sizes of particles all over 400 m3/h, but its purifying ability to formaldehyde is general. If you do not have a high demand of purifying formaldehyde, this type is a good choice. KI-GF70-N is sold around $800 and its applicable area is around 50 ㎡. If you want an air purifier with more balanced overall performance, you can choose the type KC-Z380SW1 with formaldehyde purification CADR value up to 200 m3/h and applicable area 28㎡-48㎡. It is more suitable for small spaced households and its price is around $400. COWAY, an environmental appliance enterprise from South Korea, has always been in the leading position in water purification, air purification and sanitary industry in South Korea. Its air purification products’ market share is up to 35.8% and also pass the authentication from inspection organization AHAM on the air purifiers’ performance. COWAY’s products sell well in many countries and regions around the world. In the evaluation on the air purifiers from some reviewed site, COWAY’s AP-1512HH is selected as the “most-worth-buying” type with an outstanding purification efficiency. According to AHAM’s test data, COWAY’s AP-2012EH and AP-3008FH have a better purification effect. The multi-stage filter screen system can deal with pollution under different environmental pollution conditions and this system is equipped with giant turbine fan with large air volume and stable operation, which ensure a service life of more than 10 years. The AP-2012EH’s value of particle CADR is up to 707 m3/h with an applicable area of 50㎡-80㎡. Its price is around $700. While the AP-3008FH’s value is even larger than 800 m3/h and it is one of household air purifiers with the highest CADR in the market. It can be used in an large space of more than 110㎡ and it is sold at around $1000. Previous Post:What you should know before buying a vacuum cleaner?